Welcome! On this site you can check out the many and various covers for Pynchon’s novels over the decades and the world, as well as the latest news, and links to great online Pynchon resources. And, for those who are new to reading Pynchon, read the “Newbies” article. For in-depth analyses, guides and page annotations for each of Pynchon’s novels, visit the PynchonWiki where you will also find most of the reviews for each novel, and lots of other good info. The guides and annotations make PynchonWiki an excellent companion to readings of the novels. 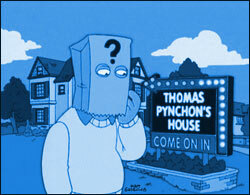 You can read Thomas Pynchon’s biography — such as it is — on Wikipedia. This 12-minute film by Laura Colella captures behind the scenes filming of Paul Thomas Anderson’s Inherent Vice, shot in grainy Super-8 color. Its name comes from the place in the Thomas Pynchon novel called Chryskylodon Institute (“from an ancient Indian word meaning ‘serenity’), an upscale rehabilitation facility in Ojai, where Micky Wolfmann is being kept.